I think most people have this kind of experience that after they bought some gadgets, electronic equipment, and have some problems which are not on list of troubleshooting with manufacturer book. Maybe you can ask someone who has same product and had same problem, or he knew how to fix it. But how many your friends have that same product or know how to fix it? If your cellphone or digital camera has a problem what is your first reaction? Go to store that you bought product and ask a technical man (Maybe you need drive a long way)? or ask your friends? 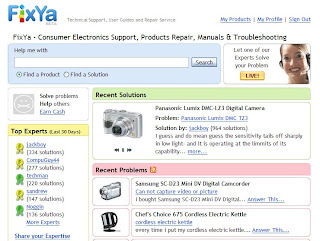 Fixya is an online technical support community, that lets you ask and answer technical question about electronic equipment and consumer products. As many online ask & answer communities, Fixya also offers free asking if you joined this community, and has a revenue program that bring some extra income to expert who answer and solves a premium problem. Join this community is free, you can ask question or browser topics, maybe someone has same problem or fixed it. It is a nice community.Helping other is also help yourself!